This End Table/Nightstand is part of the Coeur De France collection. This piece's unique form makes it suitable for a variety of spaces. 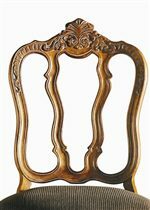 French curved shaped post offer elegant support. The single door conceals storage space with one adjustable shelf. Shown in the Normandy finish. The Coeur De France Curran Commode by Century at AHFA in the area. Product availability may vary. Contact us for the most current availability on this product.